To begin, long exposure seascape photography is a hugely rewarding genre of photography. It is achieved through the use of very dark pieces of glass called neutral density filters. Once placed in front of your camera they drastically reduce the light hitting your sensor. As a result, the photographer needs to dramatically increase his or her exposure times. I have been focusing on this for a number of years and my main area of interest has been seascapes due to their dreamlike nature. Seas turn to mist and clouds form streaks across the sky. For some of us, the other worldly results seen on the back of our cameras can be so startling that we are immediately hooked. It is not a difficult subject to become proficient at but does need a little practice. I would like to pass on a couple of hints and tips I have learnt along the way to anybody starting out. I have seen many new starters arrive at a scene and just pop a 10 stop neutral density filter on the front of their lens and release the shutter. They are then baffled and/or disappointed with either blown highlights or dark shadows in the final exposure. They have missed the first fundamental step in landscape photography – learning to balance the light between the foreground and the sky. This can be achieved through the use of split graduated neutral density filters or by combining several exposures in post processing. I personally recommend these in field application of filters. What on earth is he talking about I can hear you ask….. I shoot with the Lee Big Stopper (I cannot vouch for any other filter brand). Due to the fact they are hand-made, not each and every filter is exactly the same and some of them have slightly more or less than ten stops of light-blocking ability. They actually specify this in the literature that comes with the filter. The exposure conversion chart or app they supply is only a guide to the exposure required. I know from tests that my individual filter is actually 10.5 stops in strength. When my conversion chart gives me a 3-minute exposure, I know the reality should actually be 4.5 minutes. This results in perfect exposures every single time (provided the light does not change). Before venturing into the field it is best to test the performance of your individual filter rather than standing there for 10 minutes at a time and ending up disappointed with over or under exposure issues. Set up a test shot at home with no filters applied and take a shot. Then make 3 different exposures with your ND filter applied allowing for 9, 10 & 11 Stops of filtration. Finally, compare the histogram from the long exposure images to the histogram of your original shot. The one that matches your original exposure closest determines how strong your filter is. Long exposure photography is actually quite simple once you learn the process involved and stick to it. My biggest issue when starting out was I kept doing things the wrong way round which wastes a lot of time. Imagine the frustration you would feel when you’ve stood for 7 or 8 minutes as your camera records a scene. Then, finally the shutter closes and you eagerly chimp the back of your screen to see if you’ve nailed it. For even further learning, check out the “Landscape Photography Guide” by Photzy. We all know landscapes and seascape alike are tricky to get right and require patience and research, with the end result bringing (hopefully) huge gratification! My favourite images have been taken on dull overcast days with heavy cloud cover. i.e. bad weather. If you can time it just after a rain shower you will have very dark broody skies which really help add a sense of drama to your images. If the wind is too strong it will be hard to get a sharp image even with your camera on a tripod. These exposures can last from 1 – 10 minutes and the wind rattling your camera will destroy any potential results! I personally use my camera bag to weigh the tripod down giving it increased stability. I also try to position my body between the camera and the direction of the wind to block it as much as possible (provided it is not blowing from the side my camera is facing). Keep long exposure noise reduction turned off – this can easily be achieved in post production. Aim to spend your time looking for the best compositions in the field rather than standing, waiting on a long exposure that needs double the time to process due to the in-camera noise reduction feature. Long exposure seascape photography is a lengthy but enjoyable process that helps extend the day of the landscape photographer in that they are not confined to sunrise & sunset. Give it a try – you will be surprised by the results. I can guarantee you that you will not come home with memory cards stuffed with images as it makes you really think about what you are doing and allows plenty of time to relax and take in your surroundings. 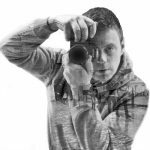 is a self-taught amateur photographer from Ireland who specializes on seascape and long exposure fine art photography. His images are a personal interpretation of the environment he finds in front of him. See his website.